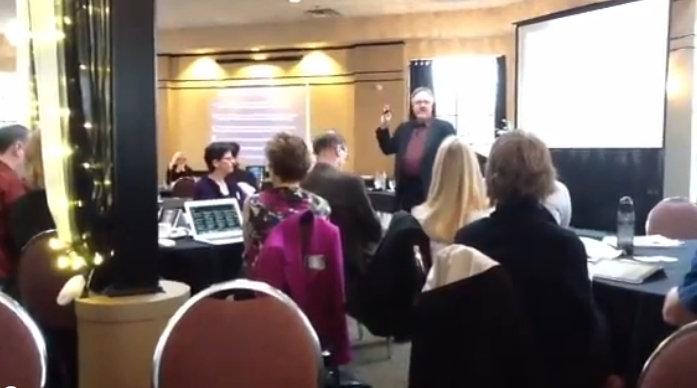 I spent Surrey Schools Focus Day 2012, February 10, taking in a presentation from David Warlick. It was a great opportunity to not only connect with colleagues, but to also stay on the cutting edge of IT and its role in education. …David’s introduction was great. He talked about “Black Swans” – instantaneous transactions by computers in the stock market. I sat there thinking, “Where is he going with this?” Turns out David makes a point of sharing something at each workshop that he had just learned. He does this to illustrate that we must continue to learn – to evolve – to be master learners…not just master teachers. Such modeling is crucial if we wish our students to be life-long learners as well. …We need to prepare students for an ever changing world – one that does not yet exist. We need to prepare students for THEIR future, not OUR future! Got me thinking about Facebook…or Twitter…or any of these relatively new phenomena. If you asked your students even ten years ago what they wanted to do when they got older, none would have responded, “I want to work for Facebook” because it didn’t yet exist. David also talked about ‘BG’ – before Google. What did people do before Google? They either sought another information source or continued to wonder! …Social connectedness is a priority. If you work with kids, you already know this. David used an interesting analogy – he called this need to be socially connected to an “invisible alien tentacle”. If they walk in our classes and we tell them to sit down and be quiet, we essentially prevent this connectedness and “chop off this alien tentacle”. …His belief (and mine) -we can’t help but learn when we are connected to many other people…all the time! Our role in this? We need to look to the edge – the cutting edge – and become “edge-dwellers”. Our students are already there. Students today don’t have a “ceiling” or limit to information – they live in an information rich, abundant, digital, connected world…a world difficult to contain. Kids expect to access and control information. If we are going to exist there with them, we can’t expect to hold them back. Rather, we need to prepare them for the ever changing world – or as David states, “prepare our kids with wings”. Effective learning…inspires personal investment, provokes conversation, and promote responsiveness from the learner. Thank you David for the countless examples of how quickly our world is changing and how seamlessly our kids are adapting to these changes. I left the session with a renewed conviction that we do our students a disservice if we disregard the pace of change, their learning preferences, and the role of social connectedness in teaching and learning. Previous Job Action…Is there a silver lining?